You can use WECPOF in design time ECO projects and in Gaffr.net files. 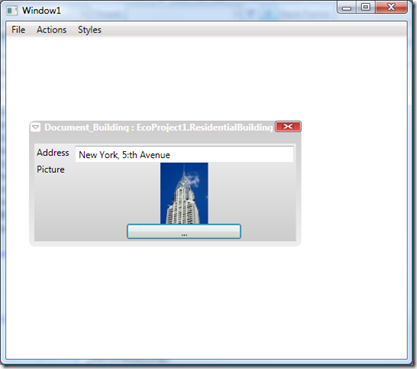 This article explains how to use it in runtime to deliver finished applications. It starts out as an ordinary ECO project (create one from the wizard, Create new project Eco project). You then create your model, update the code, configure your Persistence mapper of choice, set up any remote persistence mapper and synchronization if you want to just as the PDF-tutorials explain, Create or evolve your database, or derive the model from an existing database with the Reverse derive options. Then add a WPF-Window or a WPF-Page (for browser applications). 24:         // Tell the MenuHandling component where to put the MenuItems. Hand over the list of Actions from ECO, hand over the EcoSpace. When do you expect to share WECPOV with us? Last build of eco 5 was 27May and your newsgrp msg was next one after that date. WECPOF is part of ECO6. Everything we do now goes into ECO6. The latest release of ECO5 was a merge of some important fix from the ECO6 branch. Installing eco6 5june build on systm with both vs08 having eco4 and eco5 and vs10 will end up in vs08 only and will remove ec05 so Jonas' newsgrp advice to install in virtual machine seems to be still applicable. And of course the wecpof sample app will not run in vs08. I got error msg that it solution was built with "newer version of this application". If I install eco6 on new machine with only vs10 will I be limited to the 12 class version? ECO6 still use the keys from ECO5 so if you intend to upgrade once we release you can start using ECO6 today with your current key. But the dailybuilds are still created for VS2008 and we need to manually release VS2010 versions. If I install today's manual release of eco6 for vs2010 will it affect my vs2008 setup? ie must I install on non-vs2008 system or use a VM? Installing in a VM is still recommended.